Blockchain and Internet of Things (IoT) are both poised to be worldchanging technologies, just at the beginning of their adoption curve. When we consider how these technologies are beginning to merge, there emerges an exciting vision of future possibilities, that could result in something even greater than the sum of its parts. 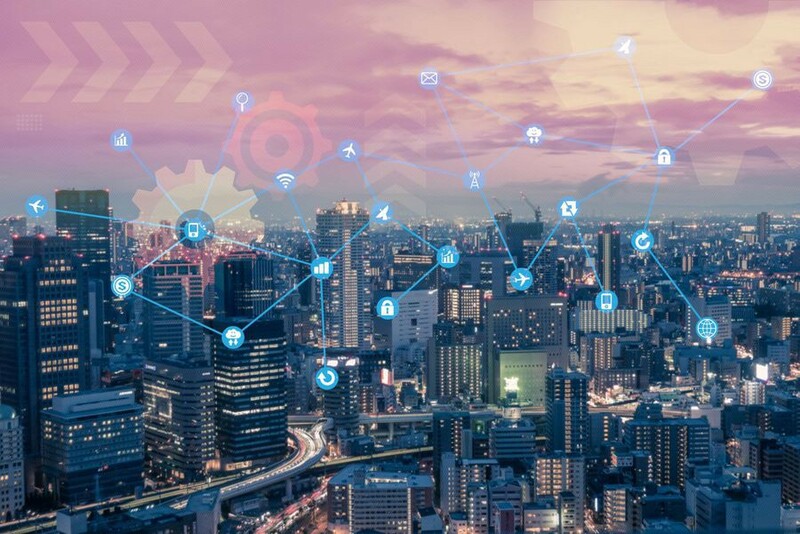 IoT — the interconnection via the Internet of computing devices embedded in everyday objects, enabling them to send and receive data. Blockchain — an encrypted, distributed computer filing system designed to allow the creation of tamper-proof, real-time records. Merge them together and in theory, you create a verifiable, secure and permanent method of recording data processed by “smart” machines. This network of interconnected devices will be able to interact with their environment and make decisions without any human intervention. The world is already full of connected devices — and more are coming. In 2017, according to analysts Gartner, there were an estimated 8.4 billion IoT devices. By 2020 that number could exceed 20 billion, and by 2030 there could be more than 500 billion. The implications of this revolution in connectivity extend far beyond just smartphones and private houses. In fact, it’s about to be applied on an industrial scale to everything from fridges to farming to healthcare, in a manner people can hardly imagine. It’s fair to say in a few years time, the physical world is going to be extremely interconnected and rather smart. However, this also represents a problem, since in their current form, IoT devices are astoundingly insecure. Hackers have thus far managed to control implanted cardiac devices, entirely disable cars remotely, and launch the world’s largest DDoS attack. The security issue is one of the most compelling reasons for utilising blockchain. Currently, any failure in an IoT ecosystem exposes multiple devices, huge amounts of highly personal data (for example, smart home devices have access to intimate details about our lives and daily routines), supply chain partners and the community as a whole. Such security flaws typically revolve around three areas: authentication, connection, and transaction. Devices that verify, connect or spend improperly with other devices are all major concerns. 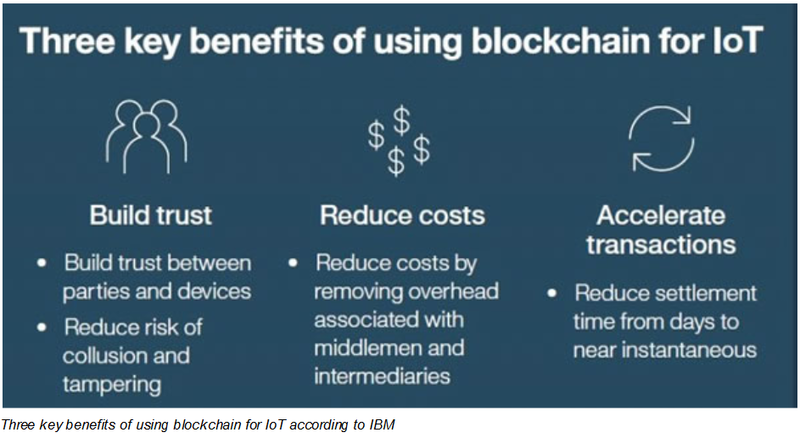 By using blockchain to manage access to data from IoT devices any attacker would have to bypass an additional layer of security that is underpinned by some of the most robust encryption standards available. In addition, because there’s no centralized authority, single-point failure concerns become a distant memory, no matter how populated a particular network is. Oversight is another vital component that blockchain adds to the IoT equation. With data transactions taking place between multiple networks owned and administered by multiple organizations, a permanent, immutable record means custodianship can be tracked as data (or even physical items) pass between points in the supply chain. Machines will record details of all transactions that take place between themselves, with no human oversight. Without the private keys giving write-access to the blockchain (which in this case would be held by machines), no human will be able to overwrite the record with inaccurate information. Smart contracts are a real game-changer for IoT applications. Through encoded logic it is possible to create agreements which will be executed when certain conditions are met. This is extremely useful for all sorts of scenarios. A most basic example is that you can authorize a payment, when conditions indicate that delivery of a service has been provided. In this way all interactions between a consumer and their connected device (or indeed inter-connected devices) are handled in a transparent, untamperable and frictionless way. There is even an opinion that blockchain and IoT convergence will become a necessity at some point. Under the prevailing IoT paradigm, devices are connected via a centralized cloud storage and processing service. This is unsustainable long-term, as with the number of connected devices and therefore data volumes increasing rapidly, the systems handling this are likely to get very bloated, resulting in bottlenecks and inefficiencies. Blockchains can solve this thanks to their distributed nature, where the data storage network is duplicated across the hundreds (or thousands, or millions) of devices which make up the network. This massive amount of redundancy means data will always be close at hand when it’s needed, cutting down transfer times and meaning one server failure will be of no consequence to business activity. So what are some of the projects working in this space? Let’s take a look at a few below. A few interesting projects are working on combining RFID and other sensor tech with blockchain in order to streamline supply chains. RFID tags make use of electromagnetic fields to identify objects and scanning an RFID tag provides the user with a host of useful data. For example, it becomes trivial to identify the product’s starting location, where it is presently located, and who has handled it. The data associated with each item is stored on a blockchain that ensures accuracy and allows the information to be instantly verifiable. WaltonChain — tracks products during each step of the production and distribution processes. Wabi — Linking digital and physical assets through RFID labels with anti-counterfeit functionality. Modum — combines IoT sensors with blockchain technology, providing data integrity for transactions involving physical products. A number of projects are also setting up inventive new infrastructure for IoT ecosystems. They are looking to improve interoperability between devices. SmartMesh — IoT protocol that enables smartphones, onboard devices and others to connect to each other without the Internet. RuffChain — trusted interoperability and paid interoperability between different IoT device systems, using these devices’ computing power to build an open ecosystem. Blockchains, however, are not a silver bullet, and there are various issues that will have to resolved before they can fulfil their potential. The main issue is the relatively slow processing speed, and the current generation will find it very hard to scale to handle the mass of signals. Network transaction fees also become problematic for services which require high volumes of micro-transactions. There is a lot of promise in newer (but still relatively untested) architecture — Directed Acyclic Graphs. The ambitious and elegant IOTA protocol (of which discussion is beyond the scope of this article!) is leveraging this and if executed properly, could do away with concerns around scalability, miners and fees. One thing is guaranteed, however. The tech will develop at a rapid pace, and devices which communicate amongst themselves will proliferate. Such smart objects will give major industries the important information they lack to keep track of inventory, control mechanisms, increase efficiency, reduce costs, and even save lives. What IoT projects are you excited about? — Let me know in the comments! You can get more details and track the projects mentioned above using Trivial’s token discovery platform that i’ve been working on — I recommend it as a launch pad for researching new projects! Find out key token info — whitepaper, team, social media, usage stats, etc. Save addresses to keep up-to-date on transactions in and out.